The garden tools with bag housewarming gift for avid gardeners is great for those into backyard gardening or even balcony gardening. A heavy duty garden tool set complete with a folding stool is indeed a very useful gift for gardeners. The compact tool bag with pockets keeps everything neatly together in one place – no more searching for a missing tool. A garden stool to sit on while gardening with the handy garden tools within reach is so practical and convenient. Those with painful knees and back will really appreciate the folding garden stool. Ergonomic garden tools are gentle on the wrists, they reduce hand fatigue. 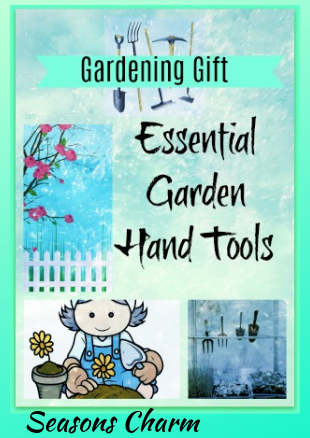 For someone just starting out on their gardening adventure, the basic essential handheld gardening tools kit that come packed in a tote bag would be the perfect gift. You can even bring your garden tools carry bag along when camping. 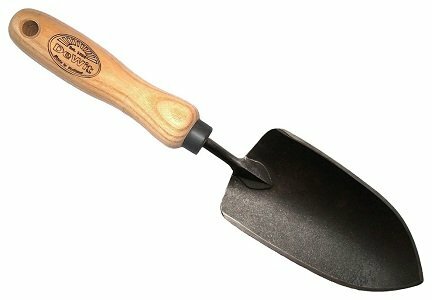 The hand trowel will come in useful when light digging is required at the campsite. So, what is the best garden tool kit set that would make the ideal gift for gardeners? The avid gardener would need to do planting, digging, aerating, cultivating, and weeding. Good quality tools can last a lifetime. 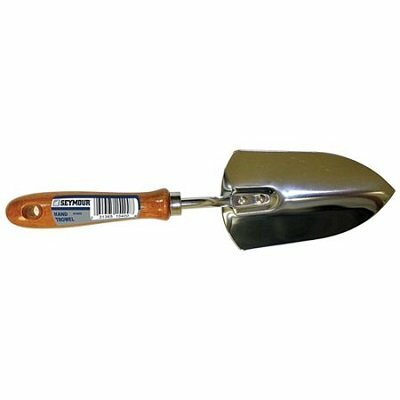 The hand trowel is used for general weeding, digging, planting seeds or bulbs, loosening, moving or smoothing soil. 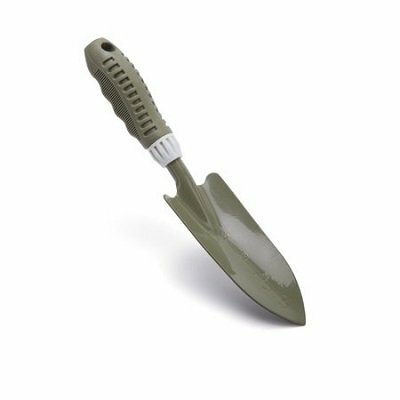 The bend-proof hand trowel/shovel is best for digging in rocky or heavy clay soils. If you can get one with an oversized trowel head, then you can get your job done faster. 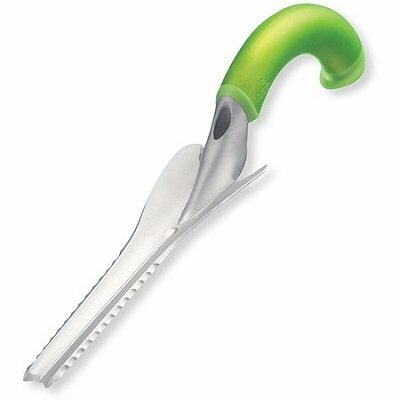 If it comes with a sharpened edge, then it can cut into the soil with less effort on your part. A tool with a sharp blade can even cut through roots as you dig. 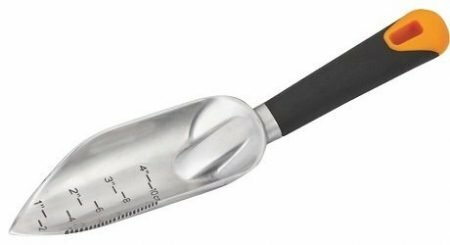 The transplant trowel comes with gradation markings on the head to measure the correct depth for the perfect transplant. 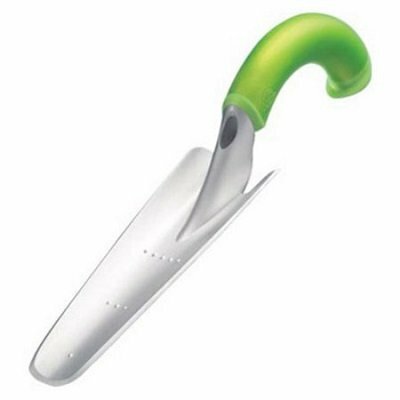 It is the ideal tool for transplanting small plants and flowers. 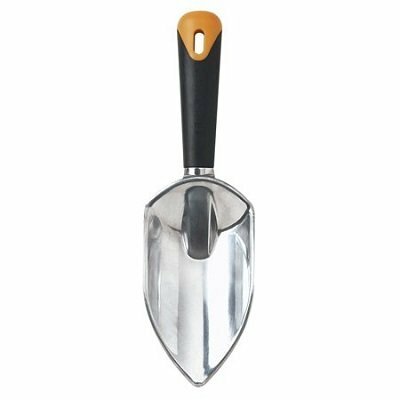 It has a narrower head compared to the broader hand trowel. 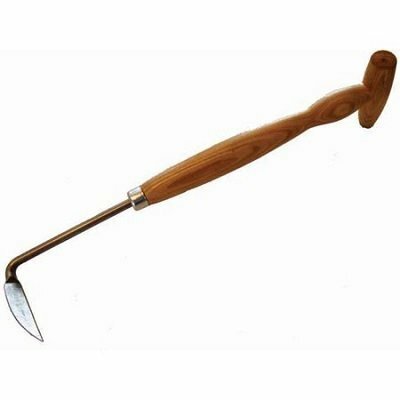 The hand weeder is best used for removing invasive weeds. You can drag it under the mulch to remove weeds without disturbing the mulch. Remove weeds from sidewalk cracks, in between your stone pathways – a great weeding tool for confined spaces too. It is a great tool for removing deeply rooted weeds from your flower beds, vegetable gardens etc. 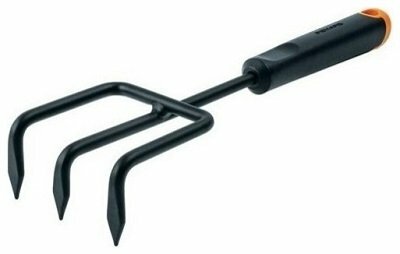 This hand cultivator tool moves through soil easily, preparing the soil for planting. 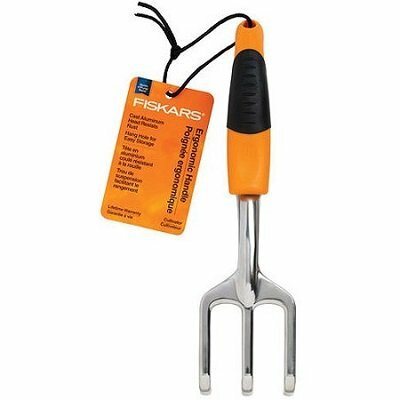 The unique angled long curved tines reach deep into the soil like a mini hand rake. Great for aerating as well as loosening packed soil, dislodging and uprooting small weeds. It works great too for raking and smoothing soil in beds and planters. 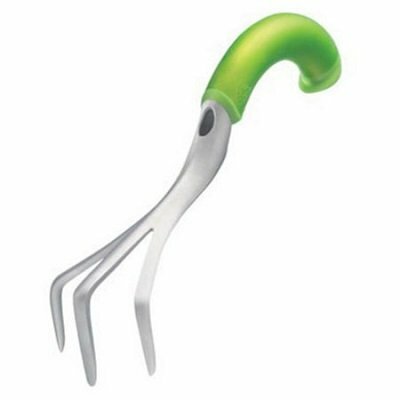 The common ones are the 3 prong cultivators but you might also want to take a look at the single prong (single prong is great for tight areas) or 5 prongs hand cultivator. The canvas garden tool tote with pockets is truly useful for keeping your tools in one place. A garden tool storage bag that can also be used as a stool sounds like a great gardening gift idea. Let’s check out some of the best garden tool tote bags that come with a few essential common gardening tools sold as a set. 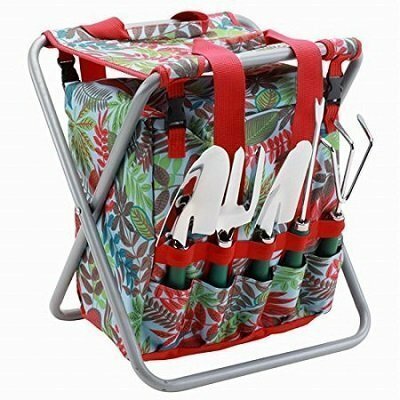 The whole gardening set consists of 5 gardening tools, a folding stool that can hold 250 pounds and a detachable polyester storage tote with enough external pockets for more than the 5 included tools. There is more than enough space for storing your tools, shears, gardening gloves etc. in these 20 exterior storage pockets and 2 interior pockets. With the storage bag, it is easier to organize your garden tools in a more tidy way. The storage bag measures 11″ L x 10″ W and has a depth of 11.5″. The garden tools are made of high resistance stainless steel and come with ergonomically designed wooden handles. Durable and rust-free, they are designed to be long lasting tools. These hand tools include a broad trowel, a trans-planter, a cultivator, a weeding fork and a weeder. The folding stool with polyester canvas seat has a steel frame with detachable polyester storage tote all-in-one. This means that the storage bag can be detached from the folding stool. The bag has 20 external pockets for easy access to the tools. A comfortable stool to sit on while gardening or pruning and with tools within reach makes gardening more enjoyable and less tiring. You might also be interested in the 10 piece tool set kit. The folding stool seat comes with a backrest. Think of the garden stool and tool set when buying gifts for someone who loves gardening. Besides being a healthy physical activity, home gardening produces organic food products for home consumption as well as a great sense of satisfaction. 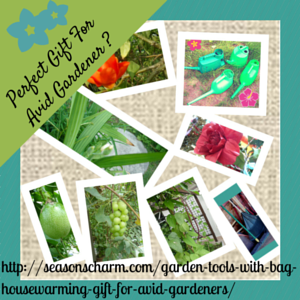 The garden tools with bag housewarming gift is perfect for those new home owners who love gardening. 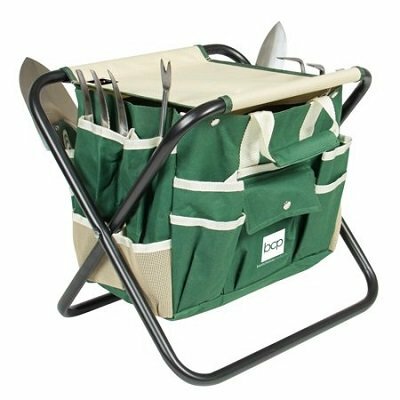 This garden hand tools set consists of 1 Tote Bag, 5 Chrome Steel Garden Tools, 1 Pruning Shears and 1 Pair Working Gloves. The foldable stool comes with a sturdy metal frame and a durable canvas seat pad. The green storage bag includes 1 main compartment and 18 side storage pockets. It clips to the seat and is convenient to carry around. It can be removed for washing or storage purposes. The pair of nitrile coated garden gloves is latex free. The portable garden stool with gardening tools set works great as a starter kit. It comes with all the essential tools. The garden stool that comes with this set has a lightweight aluminum frame with strong 6000 denier polyester seat and tote. The detachable zippered tote comes with exterior pockets for storing the included 5 metal garden tools. 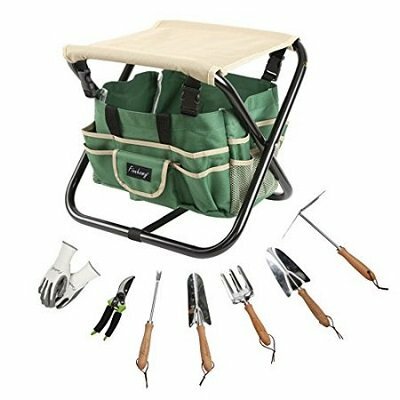 The whole set includes a folding garden seat, a zippered tote, a large trowel, a small trowel, a garden fork, a rake and a weeder. This 5 piece garden tool set has such a fun and cheerful design for its tote and chair seat. You’ll need to apply oil (eg. boiled linseed oil) on your tools to prevent rust. Apply liberally all over the tool. Leave it on for about 15 minutes, then wipe off the excess oil with a dry cloth. It is not necessary to oil the tools after every use. Just oil them every now and then.